Blogging Beautifully: Sweet treats lip balms - a bargain! Sweet treats lip balms - a bargain! I have to share with you my bargain lip balms that I recently purchased. As you may have gathered from reading my previous posts I am a tad obsessed with lip balms, can't ever be without them I must have hundreds collecting at the bottom of my bag and around the hosue. A couple years ago I started using lip smackers which are a popular American brand, however I seem to struggle to get to places that sell them at the moment so when I came across these sweet treat lip balms I was immediately sold! I purchased them from B & M which is a large shop similar to Wilkos or The Range I'd say, sometimes it can be rubbish but other times you can pick up some great branded stuff for half the cost. 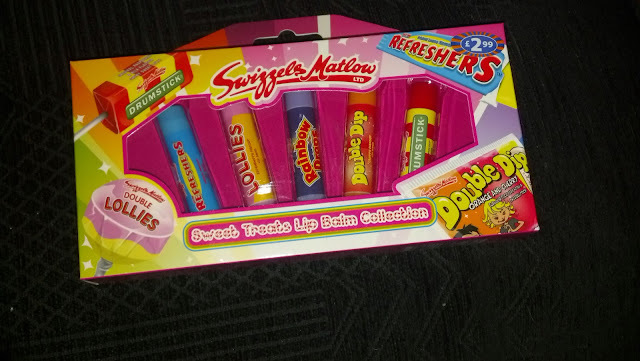 Anyway I digress, these particular lip balms are based on popular sweets made by Swizzels Matlow. For just £2.99, the flavours included are refreshers, double dip, rainbow drops, double lollies and drumstick. Has anyone else tried these or something similar? I have these!! I honestly have the Drumstick one right in front of me, also my favourite and completely delicious! ohhh..! These lip balms are my favorites. I loved to eat this. Personal Planner Review & Giveaway! !